Hamilton Island, Whitsunday Islands, Queensland; photo by Adrian Brown/Tourism Australia. Taking the family sailing into the azure blue of the Whitsunday Islands off Australia’s coast is easy; the hard part could be taming them before returning to civilization. Now and then, a shared moment strikes that just shouts ‘Unforgettable,’ and you know it will stay with you and your child your entire lives. I am in such a time. Seawater is shooting through the catamaran’s net, spraying my elder son who is sitting on my lap at the front of the boat. It rises and dips in the waters of Australia’s bright blue coral sea, while birds wheel above and islands dot the horizon. Every dip and rise creates more spray, more delighted squeals and causes little fingers to clutch mine in excitement. We are sailing among the Whitsundays, part of the World Heritage Great Barrier Reef on Australia’s east coast, and it is giving our family a sense of shared freedom, hardly experienced on land. Land had been fine as a prelude to this. We enjoyed plenty of water activities including seakayaking, windsurfing, jet skiing and paddleboarding on Hamilton Island, however, sailing was topping it all. Would we be OK? Would we be able to ensure a family holiday full of fun, sun, sea and sand? Would we run aground? We chose a chartered catamaran, through the long respected company, Sunsail. Our independent little tribe opted to have a whole boat to ourselves. However, all our food is with us. Instead of shopping ourselves and lugging it to the yacht, we opted for Sunsail to provision us, supplying food that lasts the entire trip. Yachting means that everything travels with you and as any parent knows, being free of the burdens of constantly packing and unpacking is not to be underestimated, as is the convenience of simply strolling to the fridge for a drink or a snack. Just meters away from where son and I sit at the front of the boat, lies four cabins, a kitchen, a lounge, and an outdoor table with seats all making up the compact accommodation. My eldest son proudly bears the title of “Cabin Boy” and is suffering no one else to supervise the nightly moorings, or be the first out of the dinghy when we reach island shores to play on silky white beaches or walk in the forests. Two-year-old offspring surprises us all by sighting dolphins one day and jumping up on grandma’s lap, pointing and squealing until we all run to the rails to watch these amazing animals leap about. Youngest son sleeps more soundly than any other time in his life. The rocking of the boat has him dozing before the first bedtime story is finished and he spends much of the daytime also sleeping soundly in a cabin. Aaaah, now that is a fond memory to last the rest of one’s sleepless parenthood. Though both are a little young for snorkeling, they want to know all about the underwater life, especially where Nemo’s home and school are. We could check into several inhabited islands for doses of civilization, but decide against it. With no one else to look at us and judge, we have the enviable opportunity to go feral. Every family should have a time where they can kick off the shackles of keeping clean, keeping track of time and having to be mindful of the neighbors. This does not mean we can totally shrug off responsibility. Sunsail has given us pre-charter briefings, we are in regular radio contact with them and know where the onboard first aid kit is stored. Well-prepared, well-stocked and filled with a sense of adventure and freedom, we have left it all behind to enjoy days filled with beautiful scenery, including an ever-moving montage of green, forested islands, some close and beckoning, others far off and mysterious. We explore forest tracks, being able to take all day if we need (young children are not known for their brisk, focused walks), sailed up inlets to discover rocky cliffs, and floated into little bays. Wildlife seeks us out. Green turtles poke their heads above the water like moving wrinkled periscopes and eagles spiral on the thermals above us. The kids spend their time barefoot, half-naked and thriving on a wild diet of beachcombing deserted beaches, paddling, swimming and using nature’s toys — sticks, rocks, boulders and trees — as playgrounds. We adults are finding our untamed sides almost as fast and there is something happening to all of us: an ease together and an emerging of carefree personalities that do not usually get a look in. Now we are sailing back to Hamilton Island, unsure about draping the garb of civilization back around us, but definitely full of memories of sharing a happy, uncivilized holiday at sea. Safety is the first thing that pops into every parent’s mind when boarding a boat, however, your children are safer than we may first think. Various features such as railing and netting create a safe environment for children and the Whitsundays do not present the kind of large ocean waves present further out to sea. Older children and teenagers thrive when given responsibilities not usually known on shore, including working the radio or steering under supervision, passage planning, cooking and anchoring. For information about chartering a yacht in the Whitsundays (or really anywhere around the world as their portfolio is very varied), visit Sunsail. For information on the Whitsunday Islands region, and other things to see and do there, visit Whitsundays Holiday Information. 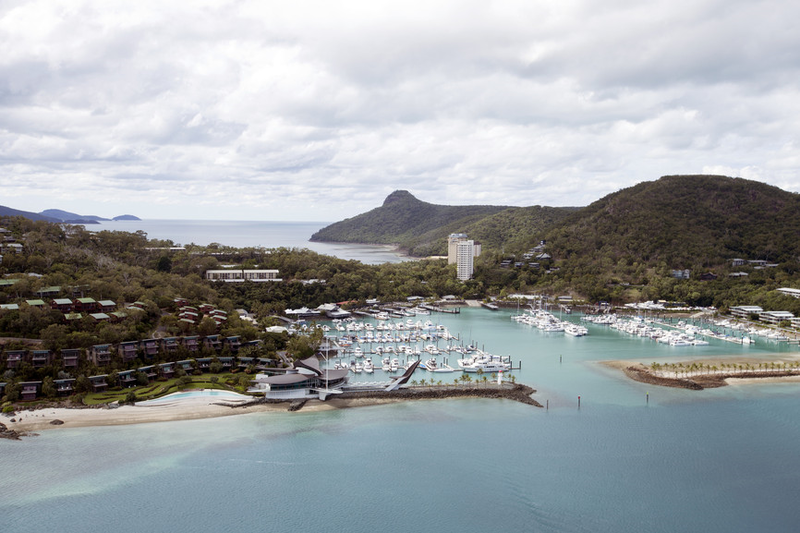 Hamilton Island is a large real estate development with holiday homes ranging from big estates to hotel rooms, bungalows to villas along the golfing greens. It is a very popular base for exploring the Great Barrier Reef ecosystem. There’s more information by checking out Hamilton Island online. We are off to the Whitsundays with our two girls for ten days and the article sounds great. We're provisioning ourselves though, as we save alot of money each time we sail from Shute Harbour. We've also practised man-overboard procedure in our pool and have increased the frequency of our girls swimming lessons and have stinger suits.